Keeping Healthy after the Hospital is a guidebook that introduces recovery and wellness concepts to people experiencing a short-term psychiatric hospitalization. It motivates users to take steps toward better mental and physical health upon leaving the hospital. 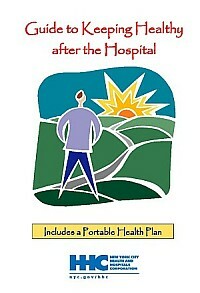 Included are the guidebook, a pocket-sized portable health plan, and instructions for clinicians. The guidebook is best used in clinician- or peer-facilitated groups, but it also can be used independently by people living with mental illnesses. As they work through the guidebook, users come to better understand why they’re currently in the hospital, how they can safely leave, and how to stay healthy after the hospital. They begin thinking about goals they want to pursue after being discharged, to build their motivation for recovery and wellness. The guidebook offers simple steps users can take to feel more in control of their health, especially after discharge. Based on the Stages of Change model, users are helped to explore their reasons to change or not change. They also determine what triggers their unwanted feelings and behaviors. They set goals for the near future, such as getting better sleep to prevent stress or getting more exercise. While making goals, users identify the pros and cons of making a change, as well as how to draw on their supporters and strengths for goal attainment. The clinician instructions offer a reminder that people staying in a psychiatric hospital often need help to understand and resolve ambivalence about addressing their mental and physical health. Since it is normal for people to feel conflicted about change, clinicians are encouraged to be non-judgmental and accepting. The instructions orient clinicians to the Stages of Change model and using it to motivate behavior change. Clinicians are asked to use the guidebook as a shared-decision making tool to stimulate conversations about people’s strengths and struggles. The portable health plan is a one-page document on which users record their name and contact information, along with that of an emergency contact. They also specify which medications they currently take, as well as those that they prefer to take during a crisis and those to avoid. They also record the name and contact information of a doctor, and how they would like to be treated if in crisis. No experience is needed to use the guidebook. However, it is recommended that clinicians using it be familiar with recovery concepts and processes, as well as the Stages of Change model. 1. The guidebook is intended for use during a hospitalization, but users should be feeling less in crisis before working through it. 2. Before goal-setting, users are asked to think about what led up to their hospitalization. If it is too difficult for someone to think or write about that, clinicians and group members will help the person decide whether to move on to goal-setting or whether to try this process another time. 3. There are many people who don’t know about recovery, and the hope it brings. As a clinician, you’ll need to assess how much time to spend explaining recovery and its components to some or all of the group members. Having a foundation in recovery makes this guidebook even more powerful. 4. As much as possible, people should work through this process with their treatment plan and other goals in mind.